What do DJ's do Live on Stage? Home » What do DJ’s do live on stage? Whether you had a bad experience with a DJ at an event in the past or you just enjoy being the center of attention, the desire to want to be a DJ is not as uncommon as you would think. This is especially true if you have a love of music and enjoy entertaining others. So, what do DJ’s do exactly. It is apparent that they play music and mix multiple tracks together at any given time to create a unique sound that will entrance the crowd, but what else do they do? This article will explore some of the intricate nuances to being a DJ and what actually goes on during a gig. Before we can even begin to delve into what DJs do live on stage, we need to dispel the myth that DJs are not needed. Many ask the question as to why a DJ is needed at all because “don’t they just push buttons?” Another popular question is “can’t we just make a mixed playlist and save the cost of hiring a professional DJ?” The answer to both of these questions is yes, however there is much more to being a DJ than pushing buttons and playing a list of music. Being a great DJ takes a high level of skill and talent which we will discuss in greater detail in this article. What sets DJs apart from just hitting play on a playlist? Being a great DJ takes more than throwing on a pair of DJ headphones and mixing a few tracks together. 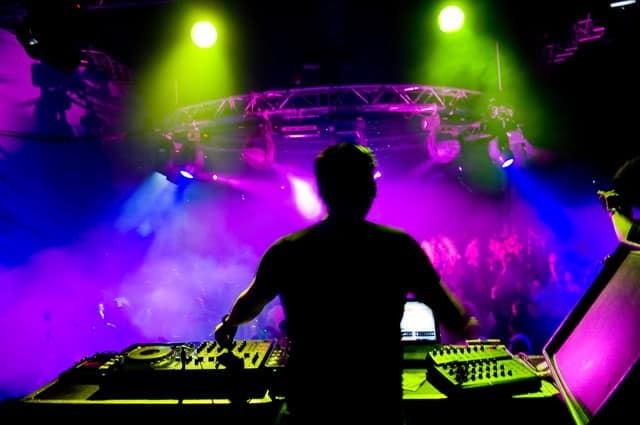 A talented DJ will be able to assess the pulse of the crowd and choose songs that are appropriate for that venue. Even if you are the best party planner in the world, just setting up a pre-recorded playlist to a set of speakers is going to make your event seem dull and lack a certain tone that only a highly qualified DJ will be able to put together. A DJ will be able to get an idea of the type of music the crowd is interested in within a few seconds of a track playing. If a certain song is not going over well with the crowd, the DJ can seamlessly transition to something else that may be more intriguing to the crowd. If you were to play your own playlist, you could surely skip a track if a certain song is not going over well but this would appear to be disjointed and awkward. There have been some well-known DJ’s to concur with this statement, however there is much more than just hitting a few buttons and twisting some knobs to make a live performance stellar. Twisting knobs, buttons and creating a customized playlist for the vibe of the event is something that is a common trait amongst great DJ’s. But more so than that, DJ’s often have personality and can get the crowd pumped up. The trouble is that a DJ must walk a fine line between being overly obnoxious on the mic versus engaging the crowd just enough to get them on the dance floor. Having the skill to not only use a DJ turntable but also hype up the crowd can be quite a challenge and takes a great deal of practice and finesse to perfect it. As with any job there can be challenges that one must overcome. It is not uncommon to experience faulty equipment or other mistakes while DJing live. The critical component to dealing with a live DJ fail is to do so in a professional manner and to keep the crowd’s knowledge of the faux pas at bay as much as you can. If it becomes blatantly obvious such as the entire club going quite, perhaps draw attention to the issue and make a light joke about it while you get your system back on track. A great DJ will be able to handle this with no problems and get the crowd back up and on their feet in no time at all. Even the greats such as Tiesto, David Guetta, and Martin Garrix have all had their share of mess ups during a live set. There is much that goes on while DJing on stage in front of a lively crowd of adoring fans. Yes, a DJ will push buttons and mix tracks and perhaps even experience faulty equipment or a mistake within their set. A great DJ will be able to assess the pulse of a crowd, adjust the playlist according to the energy of the crowd, and manage mishaps with great ease while they transition to getting the crowd hyped again.